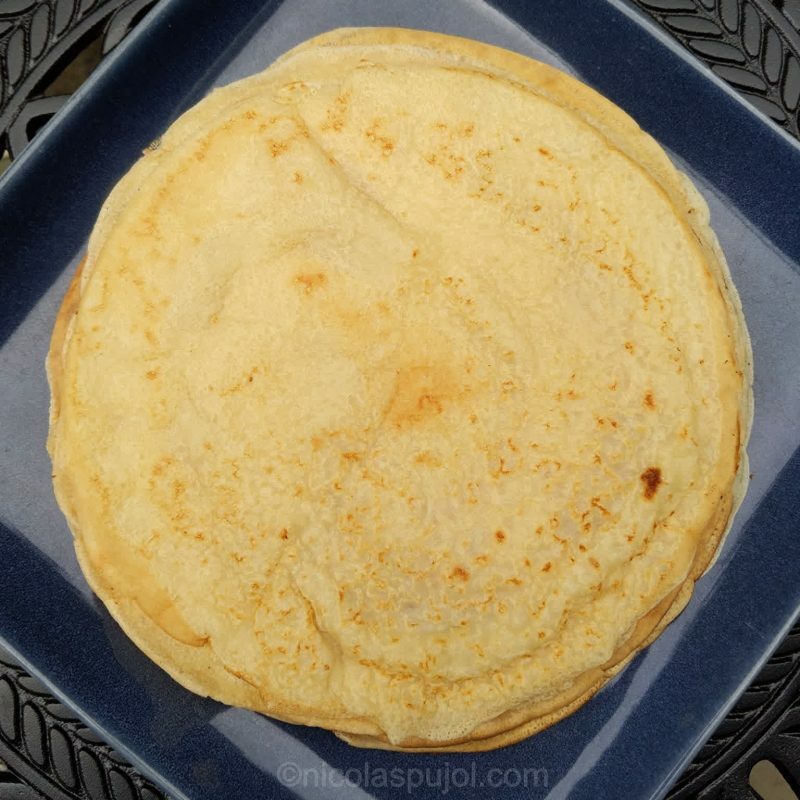 I was born and raised in France, and have been making crepes all my life. My traditional recipe, at Laylita.com, uses the classic ingredients. They are delicious and we’ve had so many family and friends breakfasts and brunches with these. Crepes are a social dish. This variation removes dairy, eggs, and some of the fat while keeping an all natural ingredient list. No artificial sweetener. 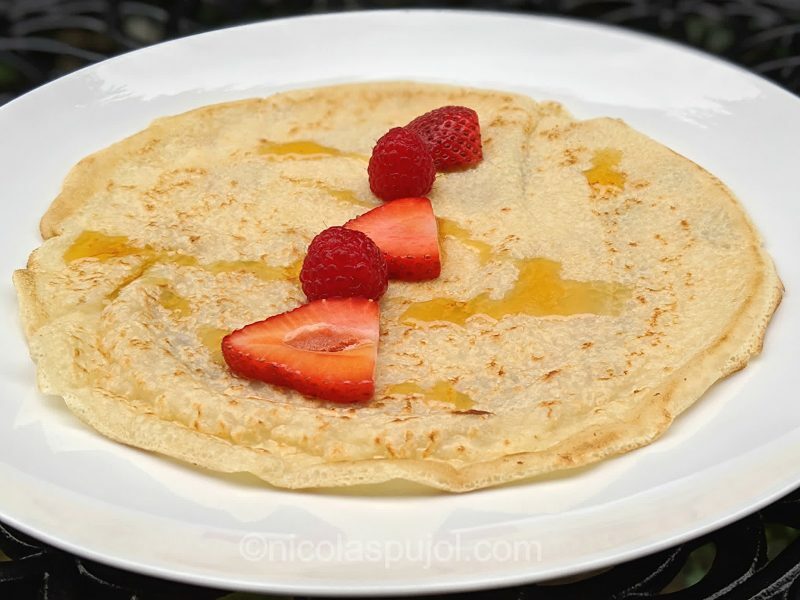 Why remove eggs, dairy and fat from crepes? 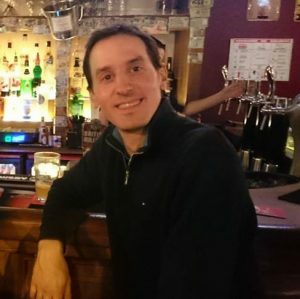 This question will need a series of posts, perhaps a new book, to discuss the topic. But the short answer is that I live in America, where the average consumption of animal products is on the high side, and where health outcomes are not great despite so much money being spent on healthcare. I am doing a reduction exercise when it comes to oil, dairy and animal products. I want to use these in lower quantities and less frequently. This means often times cooking oil free, and vegan. These crepes do have a little bit of oil, and contain no egg and no dairy. What do vegan crepes taste like? 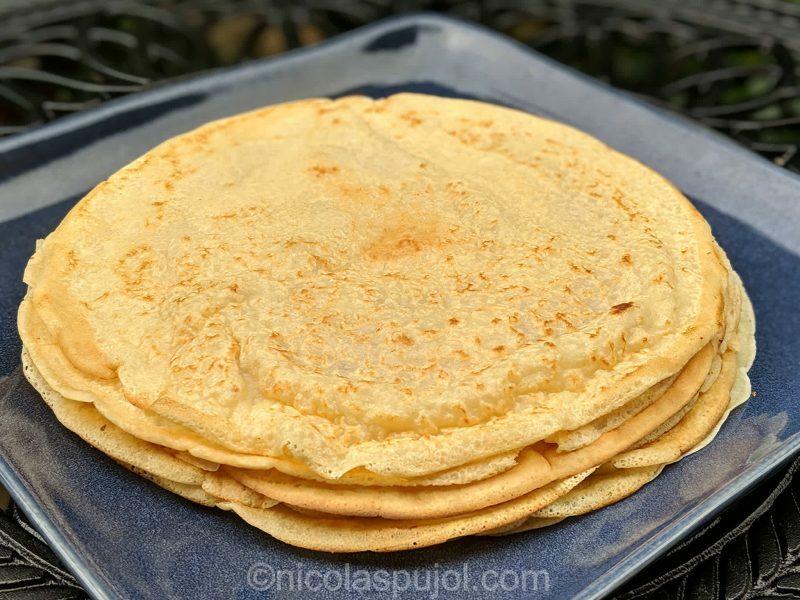 You might think that with a change of ingredients such as this, and the use of soy milk, these crepes would have a different flavor? My kids were wondering before coming to the breakfast table. So I cut a small piece of a crepe and gave it my younger son Marc, now 13. He can be quite picky, but as soon as he had a bite, he said “OK cool”, and found no issue. 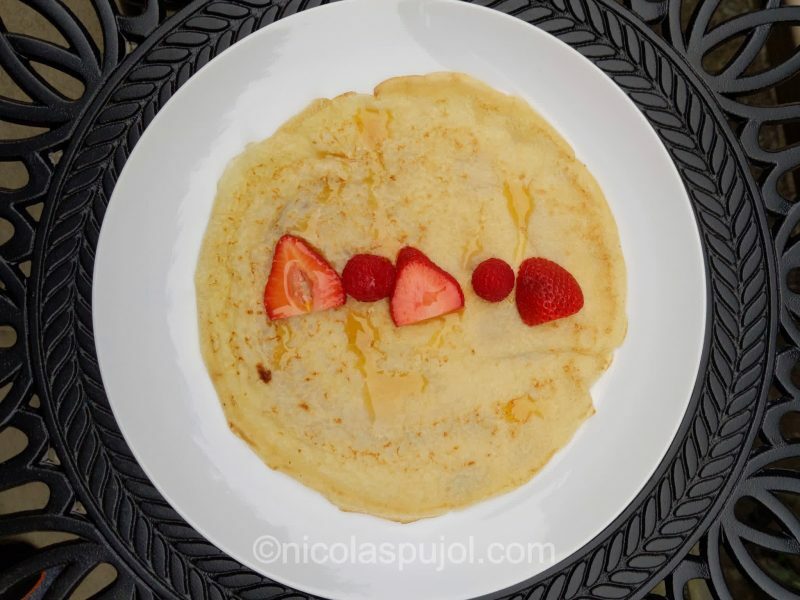 My older son Alex had his crepes as well, with the usual toppings that we serve: fresh berries, fruit jam, and so on. We try to be conscious with simple sugars without restricting them. At the end of the breakfast, after eating 3 or 4 of these crepes, Alex said “they taste about the same as the traditional ones”. While if you really look for a difference you will find it, it’s quite small. 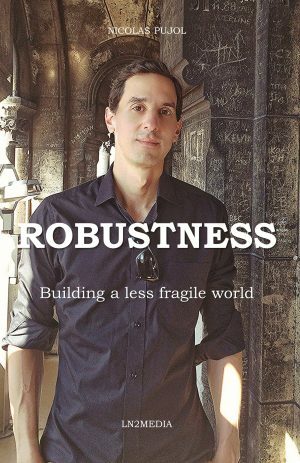 The challenge, in my opinion, is that it takes a little bit more skill to make them right. Let’s discuss that. 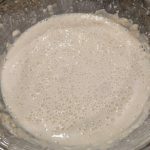 Are vegan crepes hard to make? In my lifetime I must have made hundreds of crepes, perhaps thousands. When we have people over at our house, I can make up to 40 in a single day, using two pans at the same time to accelerate the throughput. So I know what it’s like to make a crepe. The first trick is for the dough to be consistent enough for the crepe to bond when cooking, without the batter being too thick. For this, I played with the amount of soy milk to get the right quantities. Unlike other recipes you’ll find online, I am not sure you would get the same result with rice, oat, almond or coconut milk. So when bloggers say “use any plant milk”, you might get widely different results. Some will work, some will not. This recipe has been tested and validated for soy milk. The second challenge is to get the right non-stick frying pan, plus the right stove burner temperature. This is true regardless of the crepe being traditional or vegan. Each stove and pan are unique, so there is a learning curve to get the right configuration. 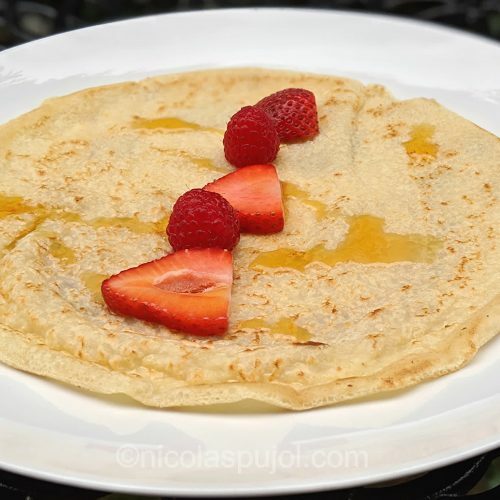 In the case of a vegan crepe like these with soy milk, I used a paper towel with a little bit of avocado oil and lightly coated it for each crepe so that it would not stick. This is very little oil, using a paper towel. On the pan there might be the equivalent of 2 to 3 drops, spread on the surface. Doing this did wonders to prevent sticking. Third, is the taste. I added the usual vanilla extract, a little bit of avocado oil, which has a neutral flavor compared to olive oil. It also has a relatively low ratio of saturated fat content, which is what I look for. As discussed in the section above, if you have good ingredients and the right proportions, you are set for success. 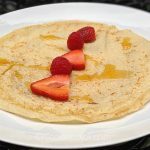 These naturally low-fat vegan crepes using soy milk taste as delicious as traditional ones, and contain no egg, no dairy, no added sugar in the dough. 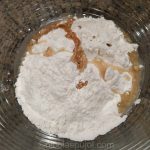 In a deep bowl, place the flour and add the vanilla extract as well as the oil. Add the milk one cup at a time, then use an electric hand mixer to blend. Doing it gradually will help avoid lumps. Heat the frying pan and coat it with a little bit of avocado oil that you rub with a paper towel. 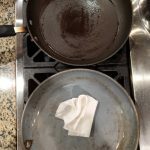 The paper towel will absorb the extra oil such that only a very small amount remains in the pan. The heat should be medium high, and the pan a non-stick pan. Note: I am using 2 pans at the same time, it is my habit. I recommend using only one until you are comfortable with the technique, and/or are making lots of crepes for a large group. In this case this will save you time. Once heated, pour the first crepe batter in with a soup serving spoon. Quickly incline the pan to let the liquid spread evenly, then let it cook for about 60 to 90 seconds. 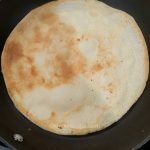 With a non-stick flat spatula, gently slide underneath the crepe to help it separate from the pan, and flip to the other side. Let it cook for another 60 seconds, then place it on a serving plate. Repeat the operation. Because these soy milk crepes tend to be a little stickier than traditional ones, I recommend re-coating with oil very lightly every now and then, again absorbing with a paper towel. It will be very little oil in the end and your crepes will not stick. Decorate with fresh fruits, jam and other mindful options.